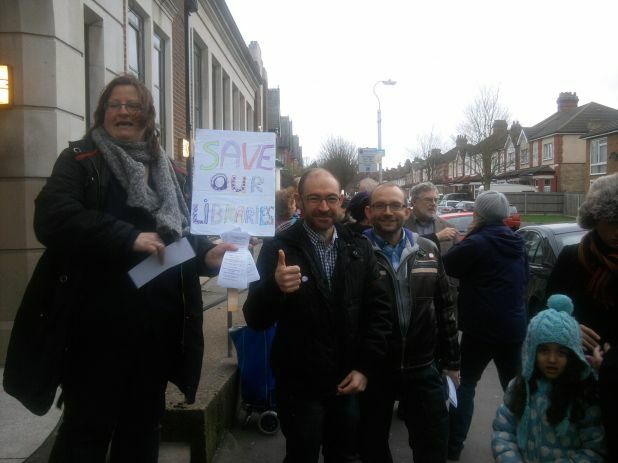 As you know, last Saturday (5th February) was a day dedicated to saving libraries. It was a fantastic day for libraries. It’s estimated that over 80 events were run in libraries up and down the country and thousands of people attended them. Members of the Voices For The Library team attended events in Yorkshire, Croydon and Doncaster. It was great that thousands of people took part and we’re sure that, even where events weren’t being run in local libraries, many more people got involved in showing their support in other ways… some visited their local public library and took out their maximum quota of books, DVDs, CDs. Others used online services provided by libraries. Lapsed users made the effort to visit their library to find out what 21st century libraries had to offer them and renewed their library memberships. So many people wanted to show that libraries are valuable to them in so many different ways. The Voices For The Library team want to say thank you to anyone who got involved in the day – whether you ran or attended an event, or did your own thing. It was such an important day and a great opportunity to send a clear message of support for libraries to politicians and library detractors. You should all be very proud of yourselves. It was a great day, especially as it generated so much media attention, and we’ll be bringing you further updates about the day over the coming week. This entry was posted in news, team blog posts on February 7, 2011 by VftL team. its great to be on your front page here campaigning in Norbury. Lets all try just a little bit harder to save our heritage and SAVE OUR LIBRARIES. It was a resounding success as was our public meeting organised by our Community Council. Due to people pressure our council have given a stay of 1 year on the proposed closures of Community Centres and Libraries. Please don’t forget that in Scotland we too are doing our best and can help the overall result. The world does not end at Watford. Can someone let us know what is generally going on Nationally so that in turn we can all support!